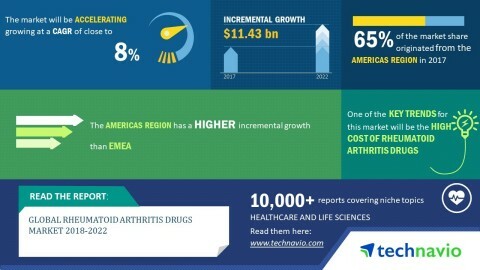 LONDON--(BUSINESS WIRE)-- The global rheumatoid arthritis (RA) drugs market 2018-2022 is expected to post a CAGR of close to 8% during the forecast period, according to the latest market research report by Technavio. A key factor driving the growth of the market is a need for affordable biologic drugs for RA. Unlike conventional DMARDs, such as NSAIDs, that simply give symptomatic relief, biologic drugs are more efficient in the management of RA. However, biologic drugs are associated with a high cost of development and are expensive for patients. Different programs, such as state-run prescription-drug discount programs, have been introduced to reduce the rheumatoid arthritis drugs cost and make them affordable for patients. Similarly, reimbursements are also provided by Medicaid or Medicare programmers, which are federally sponsored health-care program. This market research report on the global rheumatoid arthritis drugs market 2018-2022 also provides an analysis of the most important trends expected to impact the market outlook during the forecast period. Technavio classifies an emerging trend as a major factor that has the potential to significantly impact the market and contribute to its growth or decline. The cost of rheumatoid arthritis drugs and NSAIDs is less compared with biologics. However, the long-term use of these drugs can cause significant disease burden. Rheumatoid arthritis drugs management is associated with a high cost. However, the lack of early intervention can increase the cost of rheumatoid arthritis drugs due to the risks of disability. The entry of new oral drugs and drugs that can be self-administered may reduce the cost for patients. As new biologics enter the market, health plans will need to consider how coverage channels, including rebates or other discounts offered under pharmacy benefit structure, will impact future costs. “The wholesale prices of the most common rheumatoid arthritis drugs, such as HUMIRA and Enbrel, have increased by almost 70% in the US. The first drug for the treatment of RA was $10,000. Though there are a variety of substitutes available in the market, the price of this drug is now worth more than $40,000,” says a senior analyst at Technavio. This market research report segments the global rheumatoid arthritis drugs market by type of molecule (biologics and small molecules) and geographical regions (APAC, EMEA, and the Americas). The Americas led the market in 2017 with a market share of more than 65%, followed by EMEA and APAC respectively. The dominance of the Americas can be attributed to the need for affordable biologics for RA and unmet needs of safer biologics for RA. The prevalence of RA in North-America (Canada and the US) and in northern and middle Europe is high compared with southern Europe.